I was completely overwhelmed with a house that was over 90 years old filled to the brim with four generations of things from my family who had all passed away. They never threw anything away. I honestly did not know where to turn, when a friend gave me Marea's number. I'm a firm believer that you meet people in your life for a reason. My family was never wealthy, but they saved everything. Add in a relative who was a bit of a hoarder and I had a big problem. When Marea came to the house I was very embarrassed. My embarrassment quickly turned around when I realized she was actually excited about some of this stuff I thought was junk ! I have never seen anyone work as hard as they all did. I was amazed at what they accomplished in days, that I had been worrying over for years. The planning, set up, advertising and Marea's knowledge of so many different aspects of what people collect brought people from all over. There were actually people sleeping in their cars in front of the house overnight to be first at the sale. It's easier to let go of things when people respect your feelings. They realize the attachment items may have, because they had meaning to a person you loved. The guidance, caring, compassion and patience I was shown by Marea , Cheryl and everyone who worked will never be forgotten. For that and for all the long hot hours and hard work they put in to make the sale a huge success. I will forever be grateful. Char W.
If you want a successful estate sale you will want to hire Marea and her team. I have had two very large estate sales.... both were handled extreamly professional, from the beginning interview, set up, pricing, controlled traffic and permits, I would give them a A+ rating. Friendly yet professional, also treating your possissions with the highest regard. I highly recommend them, Nancy H.
I was very impressed with your sale. Staff was very helpful. What a pleasure to be able to shop at a sale once again. Being retired I am unable to buy at many other sales. I love my chairs and lamp. Gerry W.
Thank you so much for everything ! Thank your wonderful team for me and hope to see all of you on a fun basis. What a crew. Knowelegble, congenial, hard working, willing ! It doesn't get any better than that ! And everyone is needed for what they do. Better yet they're willing to do whatever is needed. Thats what makes "Memories by Marea" work ! Not to say that all the time given by you, Marea isn't key. Research, emails, calls, planning and all else. Keep up the great work ! "Job well done" You guys are the best and greatly appreciated. Sandy W.
Thank you. I am very pleased with all u did for me and have given information to people for future business. My husband and I have never been to one of your estate sales until today. We were both impressed at how well it was run. Also we were impressed at the friendliness of you and all your staff. There was a lady working the basement that was just a sweet if she could be and so very helpful. If you have an email list for your customers to remind them of your sales I would like to be added to your email list. Thank you so much and have a great Christmas! 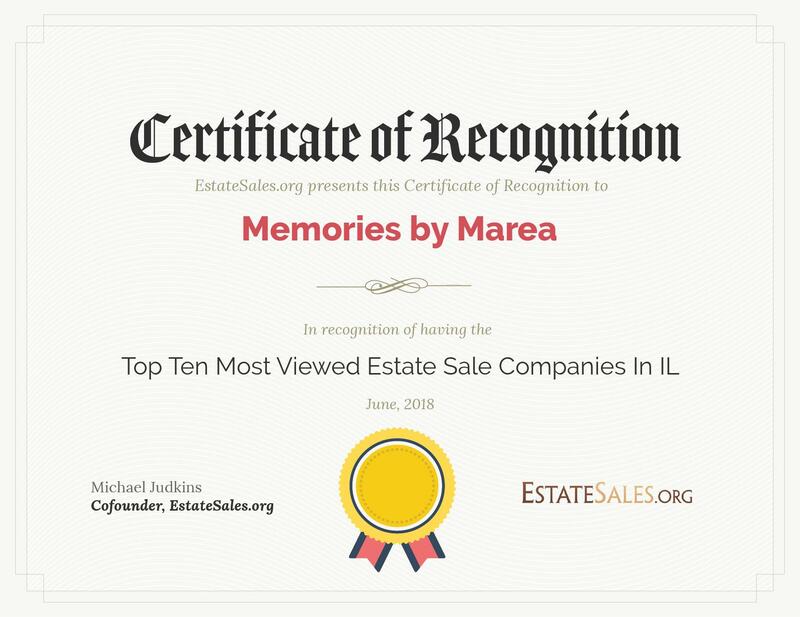 Memories by Marea was referred to me to handle an estate sale for my grandmother; who at the time needed financial assistance for long-term care. Sadly, we lost our deeply loved grandmother. During this difficult time, handling estate matters is overwhelming. I was blessed to have Marea, her family and staff's help ease the burden. Marea and her staff are strong, professional, knowledgeable, compassionate and understanding. They all went above and beyond normal responsibilities to complete the sale. I was confident, having complete trust in Marea and the others to respectfully sort, research, price and complete the estate sale. I will forever recommend and refer Memories by Marea. I continue to thank her, Marea's family and staff for a job well done! Recently, I had the responsiblity to sell my Mother's house and many of her possessions. She had moved into a Senior Retirement Center after having had medical issues preventing her from living alone. This was a very difficult and stressful period for my family. Selling several generations of family belongings involved financial and sensitive personal considerations. It was a daunting task that had to be concluded in a short time frame. No family members lived in the area. It seemed like going the Estate Sale route was our best choice. Yet researching Estate Sale companies and learning about the process made us very wary of how badly the process could actually turn out. So much responsiblity is turned over to others! As such, identifying an Estate Sale company whom you could trust was of paramount importance. Luckily for us, through very trustworthy friends, we were introduced to Marea Sutton's company, Memories by Marea. Marea and associates proved to be very trustworthy and reliable. They worked very hard and under tight time constraints getting many hundreds of items assessed and organized for the sale. They were sensitive to my needs and circumstances. They also had the patience to answer my endless stream of questions. I would highly recommend Marea to anyone looking to conduct an Estate Sale or Moving Sale. We were very pleased with the outcome. My deepest thanks to them for all their hard work.